Rihanna is no stranger to intrigue. During her GRWM (Get Ready With Me)-style Vogue video, she teased us with a couple new Fenty Beauty products. Well, they’re finally here. 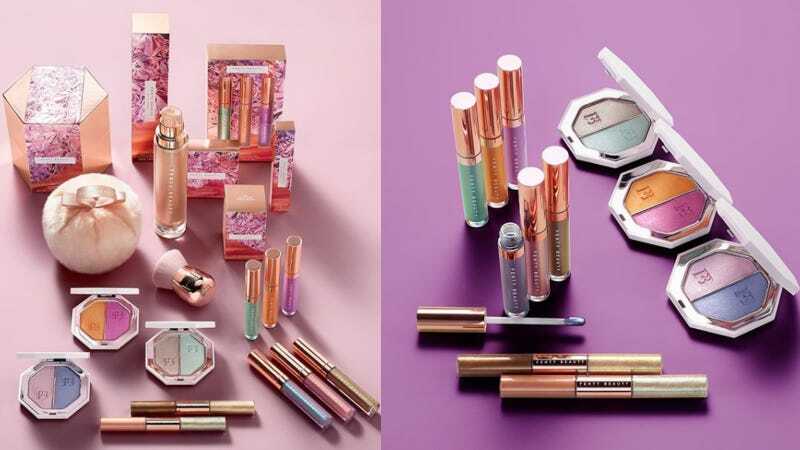 Launched today at Sephora and on Fentybeauty.com, Fenty Beauty just dropped their newest additions to the Beach Please line, that previously only featured the Body Lava and Puff. Rihanna took to Instagram to announce the full collection before it was available for purchase. The full Beach Please collection now includes six Lip Luminizers (a lip topper/gloss), two double-sided Eye Shimmers (duel-ended liquid eyeshadow), and three Killawatt Foil duos (eye/face pigments). The line is all about bold and bright colors, with lots of blues and greens and bright pinks. Fenty Beauty Goes Full &apos;90s With New Body Glitter Dubbed "Body Lava"
Basically, any summertime look you want to create is included in this line, from the shimmery Body Lava to achieve Instagram-model skin, to a minty green eyeshadow for a night out. Plus, there are instantly wearable dual-eyeshadow sticks that need to be on everyone’s eyelids ASAP.